For an introduction to the concept of Thankful for World Cinema please go here. In a day and age when it seems that remakes are more endemic than ever before, though that may not be the truth; hearing that The Old Man and the Sea has not only been re-adapted but also transplanted might send up red flags. My reaction was the opposite, I was intrigued not only by the fact there was a new version, but also the fact that the locale had be moved to Kazakhstan. Knowing the bones of the tale, even if not having the fondest memories of it, and that some things would invariably change, and that it’s a good canvas for cultural representation and philosophy; I was quite intrigued. Even knowing a few things going into the film I was very pleasantly surprised in a few ways. Firstly, the venue of the tale changes in more than a few ways. This film is called Shal, when transliterated from its native language. In English it’s just referred to as The Old Man. In short, the sea does not apply to this tale instead the film is landlocked and tells the tale of an old shepherd. 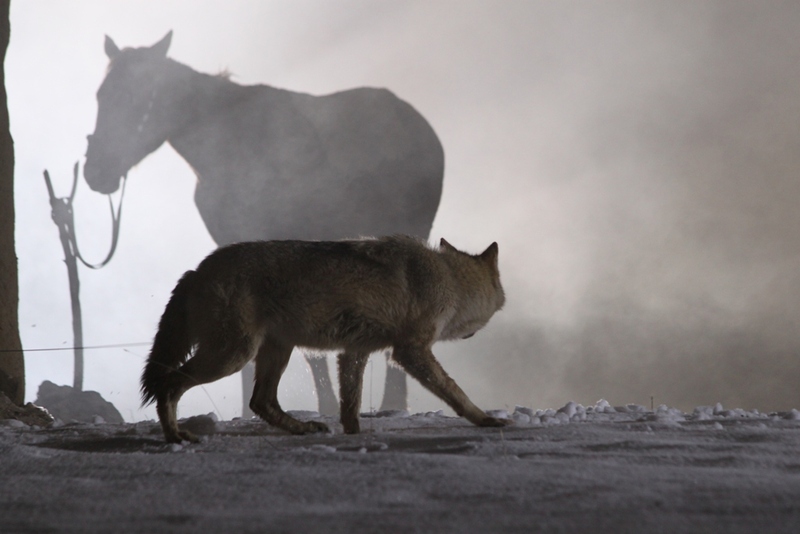 The wilderness he battles is the eurasian steppe rather than the sea, which brings wolves into play. Thus, aside from the source material it brought to mind the recent film The Grey. However, I feel this film excels far more than that one did in its man versus nature elements because it’s defenestrated to a greater degree. There are fewer affectations of traditional action films and more human drama, more philosophy, more searingly gorgeous imagery and even further respect for the beasts of prey as there is the added element of the old man protecting his herd. This is also a generational tale wherein quietly the Old Man’s grandson who he tongue-in-cheekily calls Sheitan-bek, translated as “dickens,” comes to a newfound maturity and shows his respect for his grandfather, and thus his elders. The setup of the generational divide is well-executed and though very steeped in indigenous culture and religious mores does have a universal quality to it. One example of it would be that though in rural Kazakhstan the grandfather’s passion for football knows no borders and he struggles with poor television reception to watch Barça and names all his sheep after members of Brazil’s 1970 World Cup team. The film’s scoring is as evocative as its imagery and always finds a way to beautifully underscore the tension and other emotions the film seeks to elicit. Similarly the acting runs the gamut far more than one might anticipate, and is filled with great moments both large and small. Yerbolat Toguzakov plays the eponymous role marvelously being curmudgeonly when needing to be but also showing flashes of wistful humor, soul-searching introspection and fate-cursing. Not to be overlooked though is Orynbek Moldakhan, who has to convincingly play the role of a seemingly typical gaming-addicted youth who is also believably perceptive and valiant when serious events occur. One thing that struck me while watching this film was how much more captivating it would be if experienced on a big screen. That as much as its overwhelming quality and universally truthful themes that fold in gently to the narrative, and don’t overwhelm it; are reasons that this film should see wider distribution in North America and beyond.